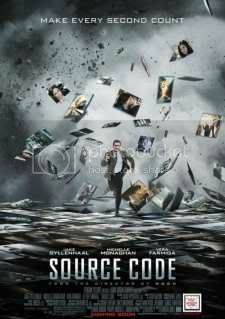 The existential crisis that plagues Source Code’s central protagonist is thematically similar to that of the lead character of Jones’ previous film. So, if you’re among the many that enjoyed Moon, Source Code will likely be up your alley. I, on the other hand, had several glaring issues with Jones’ debut film, and as such, found a lot of the same problems in the bigger, brighter, and more bombastic Source Code. Jones opens his film with a series of gorgeous skyline and overhead shots of Chicago – the repetition we find in the credits sequence serves to prompt the viewer for the Source Code’s recurring narrative structure. Eventually, we reach a Chicago-bound commuter train where Captain Colter Stevens (Jake Gyllenhaal) awakens from a deep sleep. Stevens’ sense of disorientation is shared by the audience – questions as to why we are here and who we are serve to create a level of heightened anxiety and distress that is surprisingly effective. Such lingering uneasiness is capped off with an explosion that ends a masterful opening sequence. From here, we are fed the particulars of the film’s narrative: Stevens assumes the life of Sean as part of an eight minute exercise to uncover the bomber of the train before he strikes again. The bomber scenario is secondary to the questions that Jones asks of his characters and their position within the world. Forces greater than that of its lead character assume control, wherein the hegemony dictates how and when a man can die. Criticisms of military subservience are interesting in theory and passable in execution; this, despite Source Code’s military characters (Vera Farmiga and Jeffrey Wright) being paper-thin. 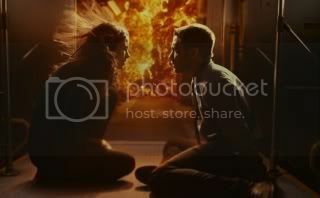 Given the eight minute limit on their relationship, Gyllenhaal and Michelle Monaghan do what they can with their romance, with Monaghan playing her role somewhat differently every time we run through the simulation. But as the film wears on, I began to look at the film more as a contraption than a genuine character-driven effort. What we understand about the characters from the onset of the film doesn’t differ far too much from what we make of them by the end. Speaking of which, Source Code’s end completely misses its stop. Defying expectations, Jones compromises the entire narrative by extending his final, muddled sequence with an utterly confounding conclusion that still has me questioning its in-film logic. It’s a shame too, since its scrambled ideas were all in place, simply waiting to be put together.